4Prof. Dr., Başkent Üniversitesi Hastanesi, Göz Hastalıkları Anabilim Dalı, Ankara, Türkiye Purpose: To investigate anatomical and functional changes on retinal thickness (RT) in patients who underwent pars plana vitrectomy (PPV)+epiretinal membrane (ERM)+internal limiting membrane (ILM) peeling for idiopathic ERM treatment. Materials and Methods: The medical records of patients diagnosed with idiopathic ERM in one eye and treated with PPV+ERM+ILM peeling and had healthy other eye were retrospectively reviewed. RT was measured in 9 different segments using optical coherence tomography (OCT). 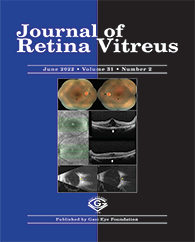 The best corrected visual acuity (BCVA) and 9 RT areas were compared preoperatively and postoperatively. Results: Study included 35 patients (male/18 female: 17/18, mean age: 67,40 ± 8,8 years). 20 patients underwent phacoemulsifi cation simultaneously, and 15 patients were pseudophakic before the surgery. None of the patients had recurrence after 12-month follow-up, all 9 RT areas in the patient eyes were signifi cantly decreased compared to preoperative values (p <0.05), while compared to healthy eyes values, there was no signifi cant difference except fovea segment (p>0.05). When the ratios between the segments were compared, it was observed that the postoperative inner temporal/inner nasal RT ratio was signifi cantly lower than the preoperative ratio and the healthy eyes ratio. There was no significant difference in preoperative and postoperative 9 RK areas between eyes with concurrent phacoemulsifi cation surgery and pseudophakic eyes. In both groups, BCVA was signifi cantly increased at 12 months postoperatively compared to preoperative values (p <0.001).